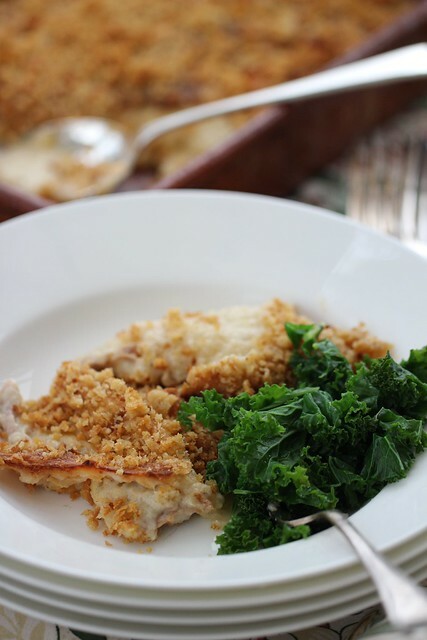 Recipe: How to use up leftover Christmas turkey: A delicious gratin! I make no apologies for re-running this recipe from my cookbook Friends, Food, Family for a deliciously soothing gratin of leftover turkey, which my mother makes every year on Boxing Day. It’s a quick and easy dish (only six ingredients plus breadcrumbs for the top) to prepare: after all, who wants to be chained to the stove on the day after Christmas? Always accompanied by a fluffy, butter-filled baked potato, this is a dish of pre-cooked turkey, covered in a creamy sauce, made with stock, enriched with leftover meat juices (if you have any), and thickened with a simple roux (a paste of butter and flour). 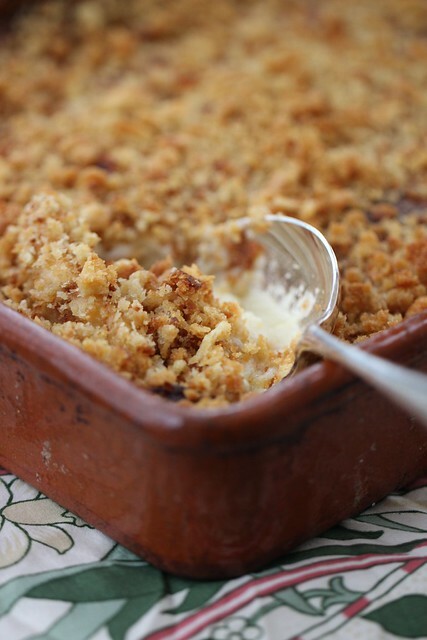 The top is strewn with grated cheese, and over all is a blanket of crisp, butter-fried breadcrumbs. It is an intensely comforting dish. It’s delicious served with a big pile of vitamin packed greens – the slight astringency of chopped kale is excellent, as in my photos above, and cabbage is particularly good. I think the recipe for stir-fried finely sliced Brussels sprouts with flaked almonds and lemon juice from Friends, Food, Family would also be wonderful with the gratin. Elizabeth David’s version of the French classic Emince de Volaille originally inspired this version, which is based on my mother’s. There are two ways to make this: either with leftover meat, or by poaching the turkey from scratch. If you do poach the turkey, you can then use the poaching water, strained, straight away as the stock for the sauce. Note: If you are making this in advance to serve the next day, top up the liquid from 750ml to 1 litre in total for the sauce, as it will thicken considerably overnight. Of course this can be made with chicken too. Either chop the leftover meat and place in a buttered gratin dish, or poach 1kg of turkey thighs by covering them with water, and simmering for approximately thirty minutes until the meat is cooked. Reserve the cooking liquid for the sauce, and tear the meat from the bones and place in the gratin dish as above. Grate the cheese for both the sauce and for the topping. I use the finest grating attachment on my food processor, but you can just as easily do this by hand (older children can be roped in as kitchen labour on this). Mix together the stock and milk. Meanwhile, melt the butter until it sizzles, and sift in the flour – do sift, as it helps avoid lumps. Stir together rapidly, until a smooth paste is achieved. Then start to add the stock mixture. I like to start with about 150ml, just to get the sauce going, when that is mixed together, add about 250ml, whisk this together, being sure to scrape the corners of the pan, where the paste congregates. When it has started to thicken, add another big slosh of liquid, and vigorously whisk together. Add the mustard, and continue stirring until all the liquid has been added. Add the cheese, and beat into the sauce with a wooden spoon. When the sauce is thick, but still slightly runny, pour over the meat in the gratin dish, and stir carefully together. Strew the grated cheese over the top, and the fried breadcrumbs, and place in the oven for about thirty minutes, until the top is golden and bubbling. Do keep an eye on it, as it can burn in an instant. Either use prepared breadcrumbs (Japanese Panko will do too at a stretch), or make them yourself. Cut 250gms of white bread, remove the crusts, and reduce to crumbs in the food processor, either with the blade or with the grating attachment: this will produce around 100g of crumbs. Place 50g of butter in a frying pan and, when melted and sizzling, tip in the breadcrumbs and mix thoroughly. Keep an eye on them as they burn easily. They should take about fifteen minutes to turn a dark golden colour. This recipe is taken from my cookbook Friends, Food, Family: Recipes and Secrets from LibertyLondonGirl, published by Quadrille, and available from all good bookshops, and on Kindle now. The US version is available here. I’ve tried and liked this recipe some time ago. Awesome recipe to use Christmas leftover. Your post makes my day.